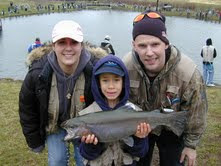 Linvilla Orchards for their Seventh Annual Family Fun Fishing Derby. Orchard Lake stocked with over 1,000 fish, which means this event’s perfect for kids. There’s pole rental and bait for sale right on site, plus there's no license needed. Lucky fishermen who snag a golden trout or tagged fish will win a prize. And since the contest’s divided into age groups, even your littlest angler might just have it in the bag. Keep your first catch for free; additional ones are just $3.99 a pound. Even if you can't make it to the derby, fishing will continue on until November.